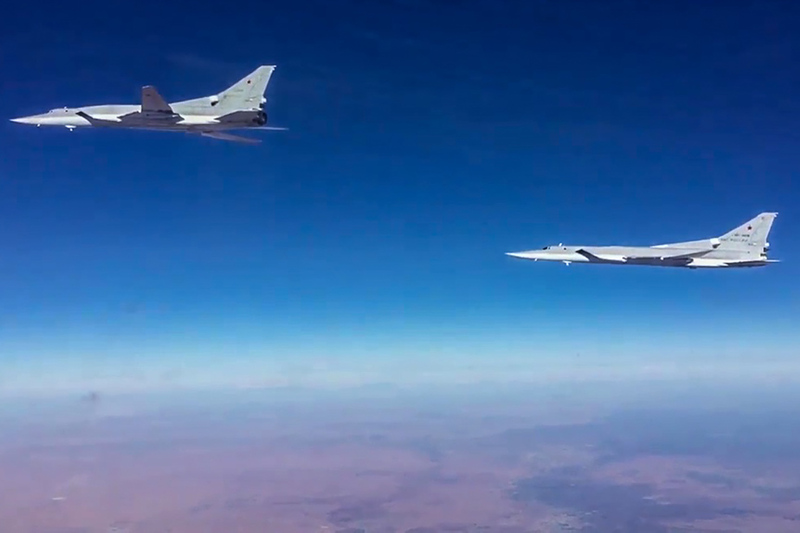 Tu-22M3 supersonic long-range strategic strike bombers of the Russian Aerospace Forces attack the terrorist facilities in the Deir ez-Zor Governorate. Earlier this week the Russian air force and the American-led international coalition carried out their first joint strike on Islamic State militants in northern Syria. Military experts say that new U.S. President Donald Trump intends to put an end to IS. That could be achieved either through ground operations or uniting with Russia. On Jan. 23, the U.S. military called the Russian airbase in Syria with intelligence coordinates identifying IS militant positions near Syria's latest combat zone, the city of Al-Bab. Later that day Russian combat jets together with fighter planes from the international coalition flew to the area and wiped out IS units that were preparing to attack Syrian government forces. White House Press Secretary Sean Spicer subsequently stated that Donald Trump was "very clear" when he said that he is "ready to work with any country that want to defeat IS," be it "Russia or anyone else." The Pentagon later flatly denied that any joint air strike had taken place. Russian expert, Sergei Rogov, scientific director of Moscow think tank, the Institute for US and Canadian Studies, said: "Until the new U.S. Defense Secretary James Mattis has his team set up it is too early to speak about radical changes in America's approach to Russia." Rogov believes that by the end of the week, Trump will order the Pentagon to set new targets and missions for the U.S. military in Syria. Experts believe that the next combat zone for the Russian air force will be Idlib Province, where more than 30,000 militants and their families are sheltering after taking advantage of humanitarian corridors following the fall of Aleppo to Syrian government forces. "With our support the Syrian Army will try to surround the terrorists, liberating the western part of Aleppo Province, as well as the northern part of the provinces of Hama and Latakia," said Vladimir Yevseyev, a military expert and deputy director of Moscow's CIS Institute. Combat in these areas is likely to last through the summer, after which Russian and Syrian forces will focus on the eastern front, on the cities of Raqqa and Deir ez-Zor, he said. "I hope that we will begin to actively collaborate with the U.S. and the war in Syria will not last longer than another year," Yevseyev added. Experts agree on one thing: Donald Trump's decisiveness and his desire to put an end to the Islamic State. "Varying approaches are possible: Sending a ground contingent to Syria to conduct combat operations; increasing financing of the so-called moderate opposition and the Kurds, which will aggravate Turkey, America's key ally in the region; or the development of a real plan of military cooperation with Russia," Rogov thinks. Retired colonel-general Leonid Ivashov, who is president of the Moscow-based International Center for Geopolitical Analysis, believes agreement on objectives and the distribution of responsibilities on the front will occur only after Russian President Vladimir Putin and Donald Trump meet. But Rogov stresses there will be challenges to any plans to collaborate that are formulated. "The idea of cooperating with Russia will encounter fierce resistance in the Pentagon. It is extremely doubtful that Trump and American society will agree to a ground operation to defeat IS according to the Afghan or Iraqi model. Therefore, we should not exclude the possibility of military cooperation," he said. If cooperation does take place, it will be the first such military alliance between Russia and the U.S. since World War Two II. "But it is still too early to speak about this," Rogov concluded.